On Friday 11th January 2019, I had finished a meeting in Oxford and I was walking through Cornmarket to catch my bus home. Suddenly, a crowd of young people appeared, marching towards me, bearing placards and chanting. As they got closer I realised that this was my first close up view of the school children’s climate strike in the UK! I struggled to get my phone out to take a photograph, but they were moving too quickly. I had just failed the journalist test! A few days later I spotted a photo on Twitter taken by Andreas Bjorklund. But what is the climate strike all about? It started on 20th August 2018 when a 15-year-old student, Greta Thunberg, decided to demonstrate outside the Swedish parliament building until her government took stronger action on climate change. At first, she was alone, but then others joined her. Once school started again in the autumn she decided to strike on Fridays, and hence the Twitter hashtag #FridaysForFuture. It was principally on Twitter that the news spread to other countries. Most European countries have had some activity, but this has been particularly strong in Germany, Switzerland and Belgium. Brussels has seen huge marches every week. Over 3200 Belgian scientists signed a letter of support for the demonstrators. They said, “If you consider the objective science, only one conclusion is possible: the people taking the streets are completely right.” I was pleased to see a number of my friends, colleagues and coauthors among the signatories. There were large demonstrations in Australia and smaller ones in Africa. In the United States and Canada, so far it has largely been a few dedicated individuals like Alexandria Villasenor who has been striking every week outside the United Nations building in New York. Meanwhile, the instigator of the movement, Greta Thunberg, has been propelled into becoming a celebrity. But she is a different kind of celebrity. Greta is totally uncompromising and persuaded her whole family to become vegans and to stop flying. She likes school but thinks skipping classes is justified as learning will be useless if there is no future. Greta has a TED talk, spoke at the COP24 Meeting in Poland, and then at Davos, the World Economic Forum. While most delegates flew in by private jet and stayed in plush hotels, she came by train across Europe and camped with the Arctic Basecamp, a group of scientists who were in Davos to highlight the impacts of climate change on the Arctic. In Davos, Greta was totally fearless, blaming some of the delegates for our present problems with climate change: “Some people, some companies, some decision-makers in particular, have known exactly what priceless values they have been sacrificing to continue making unimaginable amounts of money. And I think many of you here today belong to that group of people.” Not too surprisingly, Greta has come under heavy attack from climate sceptics and their allies. She has been defended by many in the environmental movement, including Michael Mann, the climate scientist. The United Kingdom had been showing only sporadic activity, possibly due to our strong anti-truancy laws. I think my sighting on 11th January in Oxford was probably one of the earlier strikes in the UK. Holly Gillibrand in Fort Worth, Scotland, at 13 is already a tireless environmental campaigner, and not just on climate change. She has been striking outside her school for some weeks, often supported by a few friends. But then I spotted that there was to be a coordinated UK national strike on the 15th February 2019, followed by a global strike on 15th March. The strike had a mixed reaction from schools, with some against (at least in public), and some supporting their students. On Friday 15th Feb. 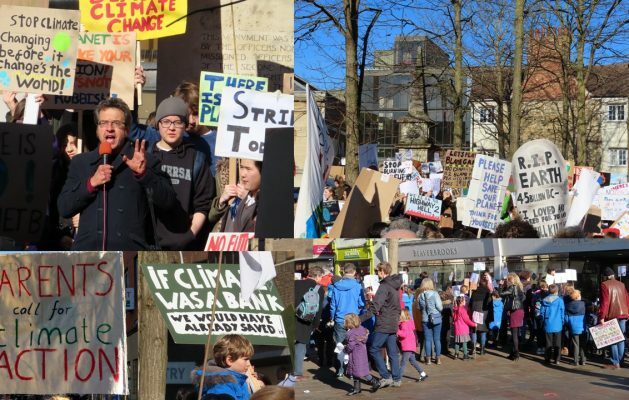 I went into Oxford, UK to see the local Climate Strike that was part of the national day of action. The demonstration took place in Bonn Square in the centre of the city. I am not sure how many children were gathered there, but the Oxford Mail estimated one to two thousand. They had made some amazing banners. There were parents and a reasonable number of fairly relaxed police, but no sign of any anarchists, and certainly no trouble. It was touching to see primary school children with little banners, carefully guided by their teachers. Most of the time the demonstrators chanted with, “Climate Change has got to go”, being a favourite. 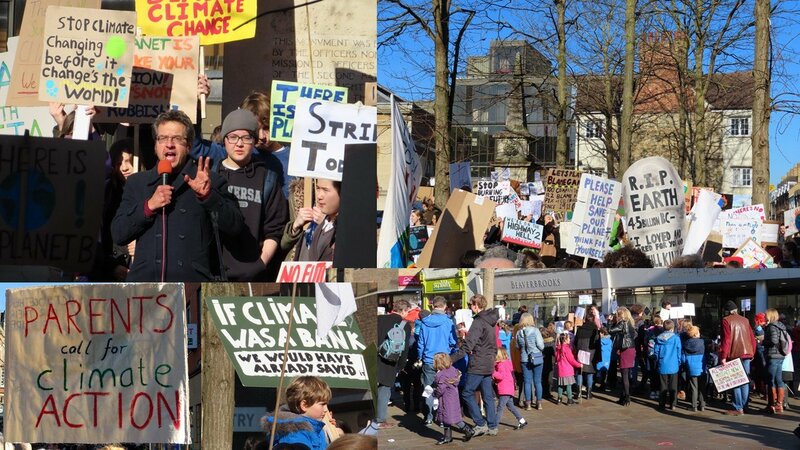 Around noon, George Monbiot, the well-known environmentalist, gave an impassioned speech. On Twitter that day he said, “The climate strike now spreading around the world is the most hopeful thing I’ve seen in 30 years of campaigning.” I agree with him. I couldn’t stay for all of the speeches (Layla Moran MP also gave one) as I needed to eat before taking a tutorial….. on climate change!! Quite what will happen as a result of these strikes is uncertain. Will they just fizzle out, or will they continue? Will they have any impact on governments? One has to ask should it really be up to children to deal with the climate change problem?? The answer is surely “No”, but they are seeing their future disappear in front of them, and what else can they do?